Endangered scalloped hammerhead sharks are thriving in Fiji’s Rewa River. Nursery sites in coastal waters are a haven for young sharks, a place of relatively abundant food and safety away from larger predators of the open seas. Fiji’s Rewa River could be one such haven. According to new research, the lower reaches of the Rewa may be a vital nursery for endangered scalloped hammerhead sharks. Fishers living along the length of the Rewa were the first to bring the presence of young hammerheads to the attention of Kelly Brown, a marine conservationist at the University of the South Pacific in Suva, Fiji. Scalloped hammerhead sharks live throughout the world’s oceans, with subpopulations everywhere from the Gulf of Mexico to the Indian Ocean and the North Atlantic to the South Pacific. They are a rare example of a shark species that spends a great deal of time in large schools. Why hammerheads adopt a social lifestyle remains something of a mystery, though hypotheses are plentiful: it could have to do with adolescent socializing, a possible prelude to mating; or simply grouping up near rich food sources. Or, it could be safety in numbers. This schooling behavior also means the sharks are particularly vulnerable to fishing. By being in such close proximity to each other, large groups of hammerheads can become ensnared by the same fishing gear, or can be more easily targeted en masse. Accidental by-catch and the fin trade are the two largest threats they face. Like all sharks, scalloped hammerheads do not care for their young—the sharks are born with everything they need for a predatory life. But to give their young something of a head start, hammerheads lay large litters of up to 30 shark pups in particularly habitable coastal areas. These locations, known as nurseries, are consistently and faithfully used as natal sites, and they are an essential place for young scalloped hammerheads to develop and mature. If hammerheads are indeed using Rewa as a nursery, confirming it would be fantastic news for those working to protect the embattled shark, and so Brown and his team set to work. Often working in strong winds after sundown, Brown and his colleagues captured, examined, and subsequently released more than 80 nocturnal baby hammerheads, many less than two weeks old. Their findings indicated a healthy population of young sharks living and feeding in the estuary. While they couldn’t confirm that the area is an established nursery—confirmation would also require the observation of pregnant females visiting the area to give birth—the discovery of so many juveniles is strong evidence that the lower Rewa is likely a nursery for scalloped hammerheads, and the first known in Fijian waters. Nik Hubbard is a freelance writer and science communicator, and is part of the editorial team at Biosphere Magazine. While he loves pretty much everything in the natural world, Nik really enjoys the quirky side of nature. He has a soft spot for the mind-blowing color change and brilliant behaviors of cephalopods, in particular. 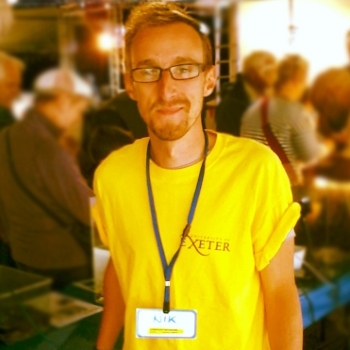 Nik attended the University of Exeter, and holds an MSc with distinction in Evolutionary and Behavioral Ecology. Cite this Article: Nik Hubbard “Scientists Discover a Likely Hammerhead Shark Nursery,” Hakai Magazine, Jun 1, 2016, accessed April 25th, 2019, https://www.hakaimagazine.com/news/scientists-discover-likely-hammerhead-shark-nursery/. Without a clear path to alternate sources of income, shark fishers are displaced, not dissuaded. When four sharks died in Florida, their corpses were split among a dozen research projects.